New data collected for the Shriver Report offers a telling insight into modern marriage. They asked 818 men representative of the adult U.S. population to choose three “qualities that [they] most want” in a daughter from a set of 10. 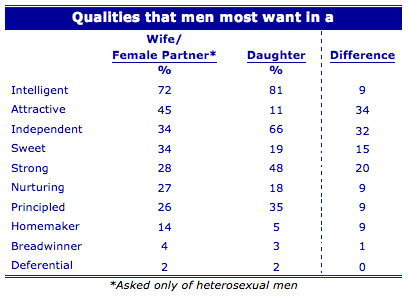 Offering the same list, they asked which qualities they wanted in a wife or female partner. Intelligence topped both lists but, from there, responses diverged. Men were pretty consistent in what they wanted for their daughters. A majority said intelligence (81%) and two thirds (66%) said independence. Almost half (48%) said they wanted their daughters to be strong. But, as a group, they were significantly more ambivalent about what they wanted from wives. Some wanted intelligence, independence, and strength, but many fewer wanted that in wives compared to daughters: 34% said they wanted independent wives and 28% said they wanted strong ones. Compared to what they wanted for daughters, they were much more likely to say they wanted attractiveness (45% vs. 11%), sweetness (34% vs. 19%), nurturing (27% vs. 18%), and homemaking (14% vs. 5%) from wives. This is fascinating data. It looks like the majority of men want strong, successful, independent daughters, but there is still a significant number who hope for wives who are willing to put their husbands before themselves. Um, this list leave out a huge X-factor. Many of those men are looking for these qualities in the "Mother" of the child, not just their wife. A childless or single man surveyed might not want nearly as much nurturing as a husband-father does. They don't care how much of a homemaker their daughter is.... until she has children. Then it probably shoots up the chart. The ones I don't understand are lack of desire for a strong or principled wife. They've already stated they don't want a deferential wife, so why wouldn't they want an emotionally strong one? Who doesn't want a principled spouse? They are hoping she raids the bank account and runs off with the pool guy? Very strange. The whole survey is interesting. Personally, I chose my husband because he was intelligent, sweet and principled, but I would like my daughter to be intelligent, talented (that wasn't on the list of choices, too bad), and principled. The population surveyed makes this one less interesting. Would have been interesting if the population was of married men with daughters. I'm not sure how to interpret results that include all ages 18 and over at different life stages. This seems like something that would inform further research more than anything else. Also, I believe that more fathers want their daughters to be independent than mothers want their daughters to be independent. That would make for an interesting survey too. The key question is "independence from whom?". Of course men want their daughters to be independent. Most parents want their children to become independent. It's a sign of failure if their able-bodied healthy children don't move on in life. When men (and women) are seeking a marriage partner, many people want interdependence, The study is useless. All useless. Or at least the interpretation of it misses the mark. If your daughter's not that attractive, you don't have to "worry" about fending off the "hound-dogs". Not all that surprising. They think of their wives as being women that they have to live with, and daughters as women living independent lives. And they're using their own ego as starting point, so of course they want their wives to adapt their lives around them. And they're thinking about how their daughters should be when they grow up - I'm sure those same men would want their daughters to be a lot more submissive while they still live at home.